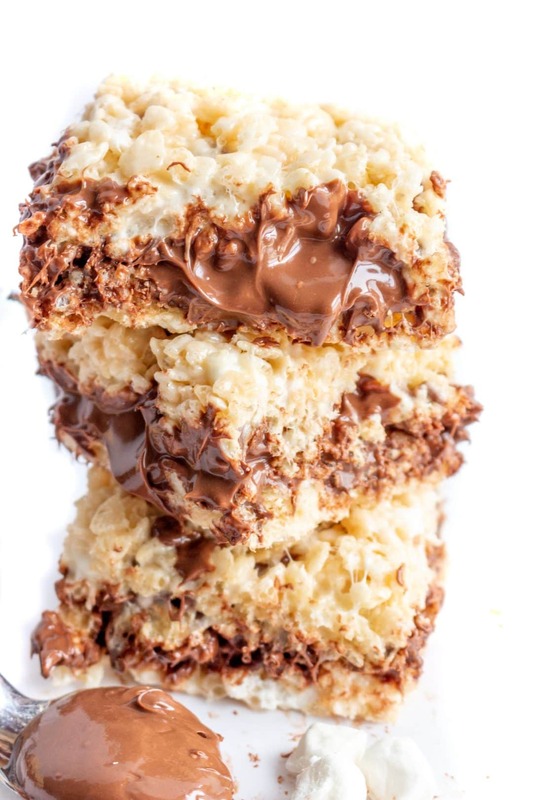 Classic Rice Krispie Treats stuffed with a layer of Nutella! 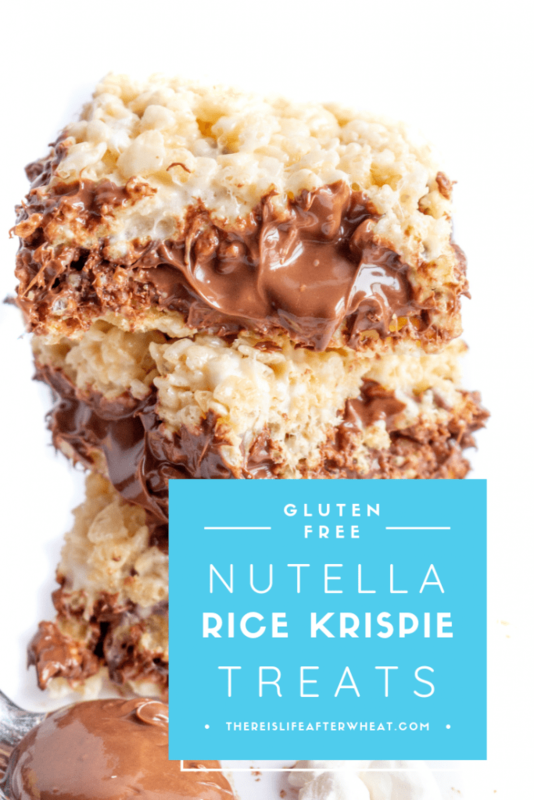 These Gluten Free Nutella Rice Krispie Treats are SO easy to make and ALWAYS a crowd pleaser. 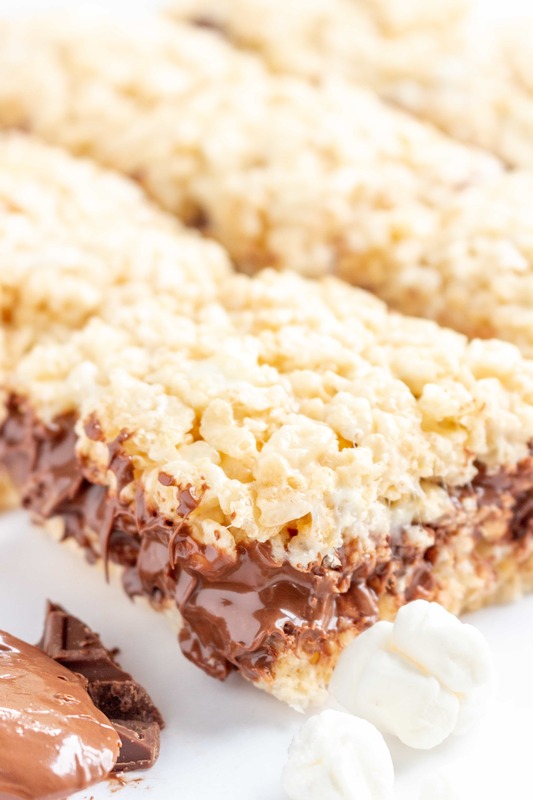 Nutella Rice Krispie Treats combine the classic, kid-friendly dessert we all know and love with a layer of creamy Nutella. If you love Nutella and you love rice krispie treats, you’re guaranteed to fall for this easy dessert! We’ve been making this recipe for years. It was one of the first recipes in our gluten free arsenal because it is just so easy to make. Nutella Rice Krispie Treats are our go-to for any kind of party or potluck because I can whip them up in 10 minutes flat and we never come home with leftovers – everyone loves them! Let’s talk Rice Krispies for a minute. It’s important to note that the name brand Rice Krispies are NOT gluten free. Gluten is a protein found in wheat, rye, and barley, and Rice Krispies (along with some other cereals) contain barley malt. It’s a small item on the ingredient list can be easy to miss. In order to make “Rice Krispie Treats” that are gluten free, you’ll need to use another brand of cereal. Our go-to is Crispy Rice cereal made by Malt-O-Meal. 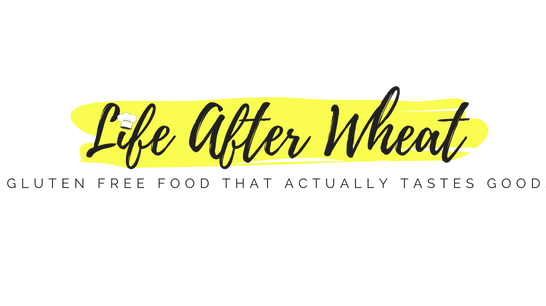 We buy it in a large bag at Walmart for around $5 and it is labelled gluten free. For those who are sensitive, I need to let you know that this bag is not certified gluten free, so you’ll want to do your own research to determine if it’s safe for you to eat it. We have also used versions made by Back to Nature and Erewon, which you can find at some grocery stores or a local health food store. 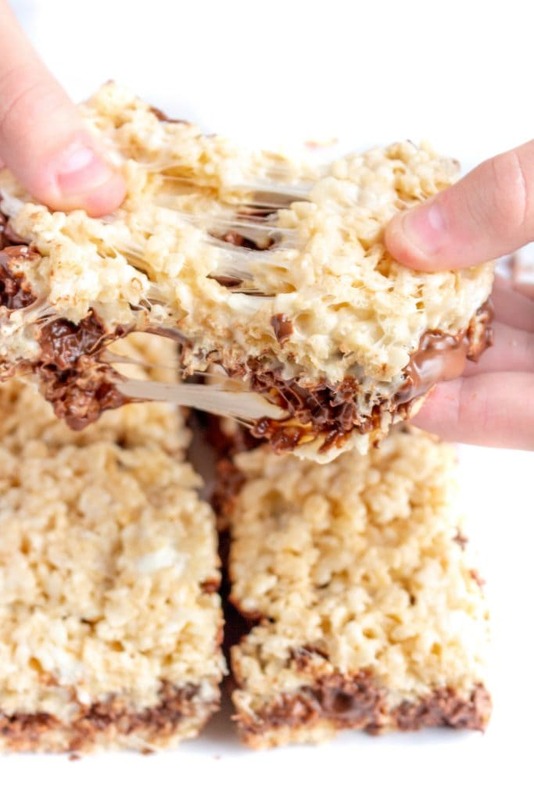 Want to make these Nutella Rice Krispie Treats dairy free? In a pinch, we’ve also melted chocolate chips with a little butter or shortening and spread that in the middle. Using Enjoy Life Foods top 8 free chocolate would be a great option if you’re keeping it dairy free. Lightly grease a 13"x9" pan and set aside. Melt shortening or butter, 15 oz mini marshmallows, and vanilla in large pan over medium-low heat. Remove from heat as soon as marshmallows are almost melted. Stir in cereal until evenly distributed. Stir in 1 cup extra marshmallows. Pat 1/2 of the cereal mixture into prepared pan. Spread Nutella over cereal mixture. Pat down remaining cereal mixture and allow to cool completely before cutting into squares. Rice Krispies are not gluten free. 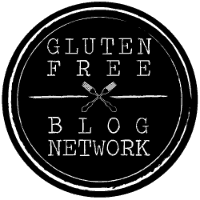 Here are the gluten free alternatives we've used. Always check labels to make sure it fits your needs. I included links to amazon below so you can see what the packaging looks like, you will probably be able to find them at a less expensive price in a local store. Substitute spectrum shortening or a dairy free alternative for the butter. Swap the Nutella for a dairy free, chocolate nut or seed spread. You can also melt 1-2 cups dairy free chocolate chips (we love Enjoy Life Foods) with a tablespoon of shortening or butter alternative to use as a spread. 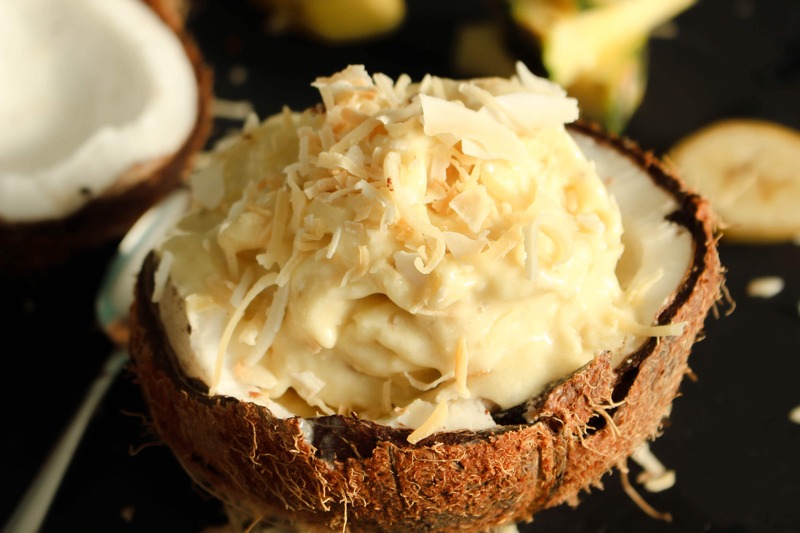 This would be wonderful with homemade hazelnut butter! Oh I would like some of these now, they look so good. I’m sure you will love them! That is a shame…but something to look forward to for sure! 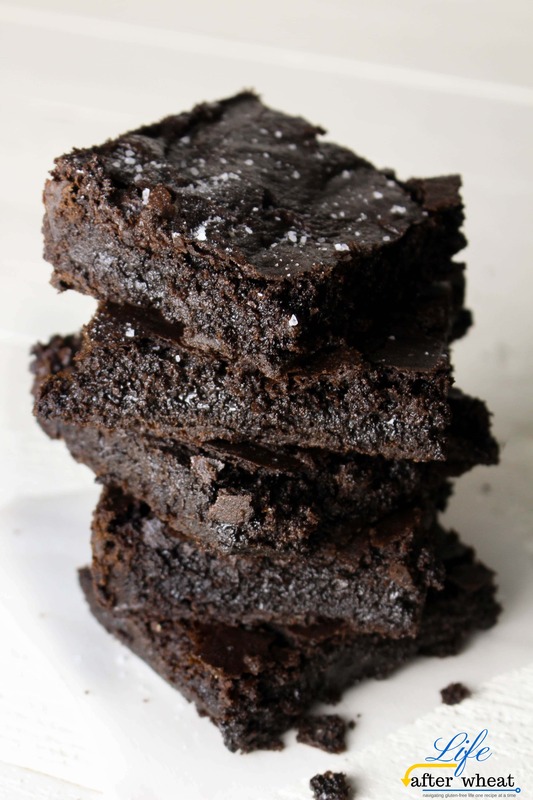 Mmmm, these look amazing and amazingly easy! I love it! YUM!!!!! I firmly believe that EVERYTHING is better with Nutella (or Justin’s Chocolate Hazelnut spread). Can’t wait to give this a shot! A STUFFED rice krispie square? Oh wow, what an amazing innovation!! This is the best idea ever… I can’t even wrap my mind around how delicious this would taste! Whoa, how have I gone this long in life without chocolate hazelnut in my krispie treats?? Ohhhhhmygoodness. I think I could die happy eating these! They look absolutely dreamy! Honestly – does it get any better than this? LOVE! 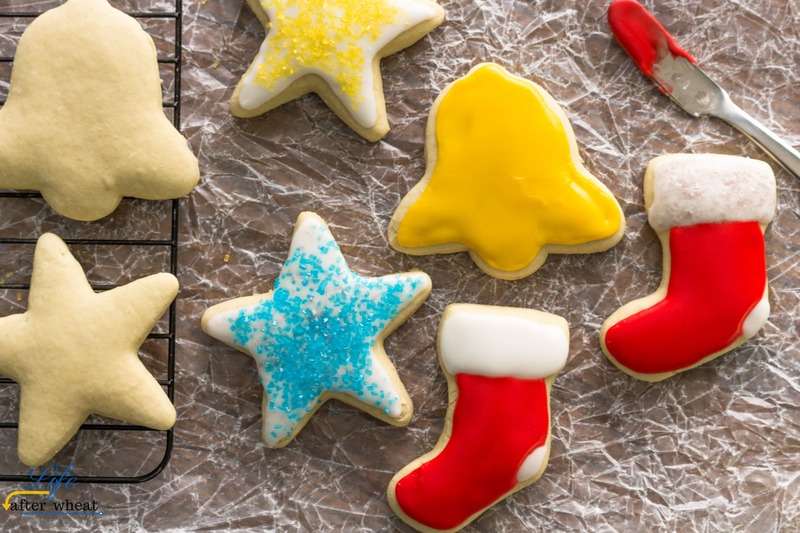 These look so yummy, I know my kids will go crazy over these!! !